Justin Smith drew an offensive foul. Devonte Green turned the ball over. Indiana’s offense couldn’t get much of anything going against Arkansas’ pressure. We’ve been here before and it isn’t pretty. But in front of an incredible crowd, more than double the size of Tuesday’s game against the Red Flash, Indiana started to turn things around in its favor. Green started knocking down 3-pointers. The ball made its way inside with purpose to Juwan Morgan, even when Arkansas made things difficult for him. And Indiana’s defense really started to hunker down and lock in. A nine-point Razorback lead at the 11:42 mark vanished into a two-point lead for the Hoosiers at the break. It was an 11-point swing over the back part of the first half and showed Indiana wasn’t going to lay over and die against an Arkansas team bringing great energy and effort on a Saturday afternoon in an NIT contest. The lead would bounce back and forth in the second half. Indiana turned it over too much early on, allowing Arkansas to jump out to a six-point lead at the 15:57 mark. 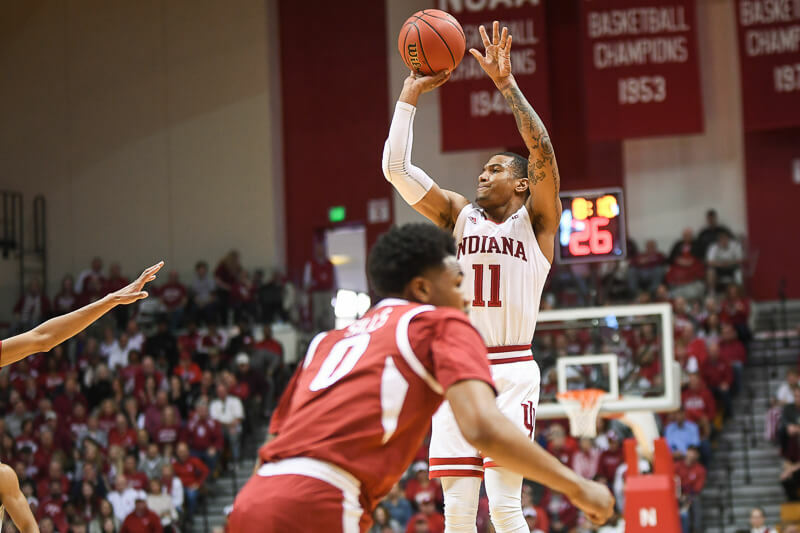 But the Hoosiers came roaring back thanks to Rob Phinisee (seven points, seven rebounds, five assists) running the show, dishing assists and scoring two points at the line. Hoosiers by four with 12:01 to go. Save for two brief leads from the Razorbacks in the following minutes, Indiana held an advantage the final 8:38 of the contest, doing just enough to keep Arkansas at arm’s length and holding on late for the three-point victory. Green started out a little shaky in this one. But as the 3-pointers started to fall, Green started to shine, continuing his late-season ascendence into a key contributor for this team. The junior hit 4-of-9 from distance and 6-of-12 overall, en route to a game-high 18 points. There’s no question he’s going to end the season as this team’s best 3-point shooter — in a season where Indiana has gotten so little there — by a long shot. He also snatched 11 rebounds and dished out three assists. Green did have four turnovers today. And at other times in his career, that would make for a game he hurt the team. But Green is bringing so much else positive of late that he’s balancing out his miscues, not letting them define his on-court existence. When Morgan and De’Ron Davis were able to get the ball on the block with time and space to operate, they excelled, and really, what else is new there? Morgan scored 15 points on 5-of-9 shooting, hitting 5-of-6 from the line. Davis was 3-of-5 from the field for 10 points. He shot just 4-of-10 from the line. They helped the Hoosiers outscore the Razorbacks 30-10 in the paint, a key factor in the win and the second game of this NIT experience they’ve dominated the opponent in the paint. It helped in a game the Hoosiers turned the ball over on 19 percent of their possessions. Al Durham shot just 1-of-8 from distance, but so many if his attempts in the second half looked dang good and felt like they were going to drop. Had a few of those gone in, Indiana wouldn’t have had to sweat out the closing seconds. Without Romeo Langford, Indiana’s backcourt is stepping up and getting things done. And you can begin to see next season taking shape with a solid backcourt of Phinisee, Green and Durham and the star from New Albany likely departed for the NBA. While no one wanted Indiana in this tournament — not the fans, the coaches or the players — it’s a silver lining to a season that’s been a disappointment.